Click on the artist to search for other event dates. 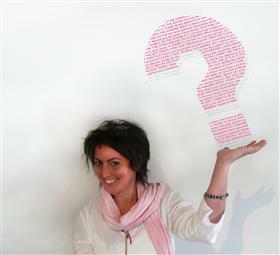 Artereal Gallery presents Quest, an artwork using a Question & Question enquiry rather than Question & Answer. This experimental piece of performance art featuring Sydney based artist Nola Diamantopoulos is on show at Artereal Gallery, 7 - 17 December. Quest is the creation of ‘channels of communication’ between the artist and the individual in an attempt to get to ‘the heart of the matter’. Interested members of the public are invited to participate in a 10 minute dialogue with Nola Diamantopoulos where complete silence will be observed. Participants will then write a question on a piece of paper. In response, the artist will reflect on this question before replying with a question of her own. And so the performance will continue for 10 minutes. The exhibition will take place from the 7 to 17 December, with performances on Friday 9 and 16 December and Saturday 10 and 17 December between 11am - 4pm at Rozelle’s Artereal Gallery. Referencing the processes which underpin the performance, the artist has adopted the symbol of the semicolon (Greek for question mark) as an emblem in a video artwork, which will accompany the performance and will be exhibited in the gallery’s Project Space. “The Quest experience is about learning to explore our subconscious thought processes so that we can identify the real issues hiding behind the mind’s rehearsed questions with which we often distract ourselves,” says Nola. If this venue is missing details or has changed operations, let us know and we will investigate and update the listing. Are you an official contact for this event ? Your enquiry will be sent to the organiser contact and posted on the event wall.